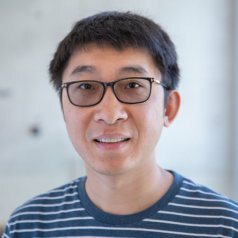 Yujia Li, PhD, joined the J. Craig Venter Institute at La Jolla, CA in 2018 as a post-doctoral fellow in the Synthetic Biology and Bioenergy Group. He is currently participating in assay development for identifying viral genes that interfere with the insect innate immune system. Prior to joining JCVI, he was a post-doctoral associate in Dr. Griffith Parks’s lab at the University of Central Florida. During that time, Dr. Li was trying to address the questions of how RNA viruses, including parainfluenza virus 5 (PIV5) and Zika virus (ZIKV), first activate and then suppress important human complement immune pathways in order to successfully replicate. Dr. Li received a BS in bioengineering and an MS in biochemistry and molecular biology from Northeast Forestry University in China, and a PhD in microbiology from University of Hawaii at Manoa. Zika virus as an oncolytic treatment of human neuroblastoma cells requires CD24. PloS one. 2018-07-25; 13.7: e0200358. Relative Contribution of Cellular Complement Inhibitors CD59, CD46, and CD55 to Parainfluenza Virus 5 Inhibition of Complement-Mediated Neutralization. Parainfluenza virus 5 upregulates CD55 expression to produce virions with enhanced resistance to complement-mediated neutralization. Human apolipoprotein A-I is associated with dengue virus and enhances virus infection through SR-BI. PloS one. 2013-07-24; 8.7: e70390.